We started in the blank media business exclusively as a wholesale distributor. So we understand the needs of our wholesale customers. If you are currently purchasing blank media, CD-R, DVD-R, Supplies and equipment for resale then we welcome the opportunity to earn your business and start building a relationship. We value our wholesale customers and pride ourselves on customer service. We offer top quality brands at great prices. We can drop ship for you too. Please contact us to discuss your purchase volume and pricing. Does Gotmedia.com accept purchase orders from government and education departments? Yes, there is a $500 minimum purchase requirement. How do I place a Purchase Order (P.O.)? Call 1-866-409-1090 and one of our expert sales representatives will help you create the purchase order and get the proper paperwork set-up with us. I did not see the item I need on your web site. Is it possible for a customer service representative to research the product I am looking for? Yes. 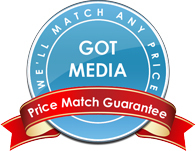 Gotmedia.com expert sales representatives will gladly provide one on one attention to Federal agencies. If there is an item you are not able to locate on our website, please give us a call and we will do our best to assist you. If you need help choosing the right product line for your business, then we are only an email or phone call away.